"Amundsen" redirects here. For other uses, see Amundsen (disambiguation). Roald Engelbregt Gravning Amundsen (UK: /ˈɑːmʊndsən/, US: /-məns-/;[needs Norwegian IPA] 16 July 1872 – c. 18 June 1928) was a Norwegian explorer of polar regions and a key figure of the Heroic Age of Antarctic Exploration. He led the first expedition to traverse the Northwest Passage in 1906 and the first expedition to the South Pole in 1911. He possibly led the first expedition to reach the North Pole in 1926; the expedition of 1926 is the earliest expedition proven to have reached the North Pole. He disappeared while taking part in a rescue mission for the airship Italia in 1928. Amundsen was born to a family of Norwegian shipowners and captains in Borge, between the towns Fredrikstad and Sarpsborg. His parents were Jens Amundsen and Hanna Sahlqvist. Roald was the fourth son in the family. His mother wanted him to avoid the family maritime trade and encouraged him to become a doctor, a promise that Amundsen kept until his mother died when he was aged 21. He promptly quit university for a life at sea. Amundsen had hidden a lifelong desire inspired by Fridtjof Nansen's crossing of Greenland in 1888 and Franklin's lost expedition. He decided on a life of intense exploration of wilderness places. Amundsen joined the Belgian Antarctic Expedition as first mate. This expedition, led by Adrien de Gerlache using the ship the RV Belgica, became the first expedition to overwinter in Antarctica. The Belgica, whether by mistake or design, became locked in the sea ice at 70°30′S off Alexander Island, west of the Antarctic Peninsula. The crew endured a winter for which they were poorly prepared. By Amundsen's own estimation, the doctor for the expedition, the American Frederick Cook, probably saved the crew from scurvy by hunting for animals and feeding the crew fresh meat. In cases where citrus fruits are lacking, fresh meat from animals that make their own vitamin C contains enough of the vitamin to prevent scurvy, and even partly treat it. This was an important lesson for Amundsen's future expeditions. In 1903, Amundsen led the first expedition to successfully traverse Canada's Northwest Passage between the Atlantic and Pacific oceans. He planned a small expedition of six men in a 45-ton fishing vessel, Gjøa, in order to have flexibility. His ship had relatively shallow draft. His technique was to use a small ship and hug the coast. Amundsen had the ship outfitted with a small 13 horsepower single-screw paraffin engine. They traveled via Baffin Bay, the Parry Channel and then south through Peel Sound, James Ross Strait, Simpson Strait and Rae Strait. They spent two winters at King William Island, in the harbor of what is today Gjoa Haven. During this time, Amundsen and the crew learned from the local Netsilik Inuit people about Arctic survival skills, which he found invaluable in his later expedition to the South Pole. For example, he learned to use sled dogs for transportation of goods and to wear animal skins in lieu of heavy, woolen parkas, which could not keep out the cold when wet. Leaving Gjoa Haven, he sailed west and passed Cambridge Bay, which had been reached from the west by Richard Collinson in 1852. Continuing to the south of Victoria Island, the ship cleared the Canadian Arctic Archipelago on 17 August 1905. It had to stop for the winter before going on to Nome on Alaska's Pacific coast. The nearest telegraph station was 500 miles (800 km) away in Eagle. Amundsen traveled there overland to wire a success message on 5 December, then returned to Nome in 1906. Later that year he was elected to the American Antiquarian Society. At this time, Amundsen learned of the dissolution of the union between Norway and Sweden and had a new king. The explorer sent the new king, Haakon VII, news that his traversing the Northwest Passage "was a great achievement for Norway". He said he hoped to do more and signed it "Your loyal subject, Roald Amundsen." The crew returned to Oslo in November 1906, after almost three-and-a-half years abroad. Gjøa was returned to Norway in 1972. After a 45-day trip from San Francisco on a bulk carrier, she was placed in her current location on land, outside the Fram Museum in Oslo. Amundsen next planned to take an expedition to the North Pole and explore the Arctic Basin. Finding it difficult to raise funds, when he heard in 1909 that the Americans Frederick Cook and Robert Peary had claimed to reach the North Pole as a result of two different expeditions, he decided to reroute to Antarctica. He was not clear about his intentions, and Robert F. Scott and the Norwegian supporters felt misled. Scott was planning his own expedition to the South Pole that year. Using the ship Fram, earlier used by Fridtjof Nansen, Amundsen left Oslo for the south on 3 June 1910. At Madeira, Amundsen alerted his men that they would be heading to Antarctica, and sent a telegram to Scott: "Beg to inform you Fram proceeding Antarctic—Amundsen." Nearly six months later, the expedition arrived at the eastern edge of the Ross Ice Shelf (then known as "the Great Ice Barrier"), at a large inlet called the Bay of Whales, on 14 January 1911. Amundsen established his base camp there, calling it Framheim. Amundsen eschewed the heavy wool clothing worn on earlier Antarctic attempts in favour of adopting Inuit-style furred skins. Using skis and dog sleds for transportation, Amundsen and his men created supply depots at 80°, 81° and 82° South on the Barrier, along a line directly south to the Pole. Amundsen also planned to kill some of his dogs on the way and use them as a source for fresh meat. A small group, including Hjalmar Johansen, Kristian Prestrud and Jørgen Stubberud, set out on 8 September, but had to abandon their trek due to extreme temperatures. The painful retreat caused a quarrel within the group, and Amundsen sent Johansen and the other two men to explore King Edward VII Land. A second attempt, with a team of five made up of Olav Bjaaland, Helmer Hanssen, Sverre Hassel, Oscar Wisting, and Amundsen, departed base camp on 19 October. They took four sledges and 52 dogs. Using a route along the previously unknown Axel Heiberg Glacier, they arrived at the edge of the Polar Plateau on 21 November after a four-day climb. The team and 16 dogs arrived at the pole on 14 December, a month before Scott's group. [n 1] Amundsen named their South Pole camp Polheim. Amundsen renamed the Antarctic Plateau as King Haakon VII's Plateau. They left a small tent and letter stating their accomplishment, in case they did not return safely to Framheim. The team arrived at Framheim on 25 January 1912, with 11 surviving dogs. They made their way off the continent and to Hobart, Australia, where Amundsen publicly announced his success on 7 March. He telegraphed news to backers. Amundsen's expedition benefited from his careful preparation, good equipment, appropriate clothing, a simple primary task, an understanding of dogs and their handling, and the effective use of skis. In contrast to the misfortunes of Scott's team, Amundsen's trek proved relatively smooth and uneventful. In 1918, an expedition Amundsen began with a new ship, Maud, lasted until 1925. Maud was carefully navigated through the ice west to east through the Northeast Passage. With him on this expedition were Oscar Wisting and Helmer Hanssen, both of whom had been part of the team to reach the South Pole. In addition, Henrik Lindstrøm was included as a cook. He suffered a stroke and was so physically reduced that he could not participate. The goal of the expedition was to explore the unknown areas of the Arctic Ocean, strongly inspired by Fridtjof Nansen's earlier expedition with Fram. The plan was to sail along the coast of Siberia and go into the ice farther to the north and east than Nansen had. In contrast to Amundsen's earlier expeditions, this was expected to yield more material for academic research, and he carried the geophysicist Harald Sverdrup on board. The voyage was to the northeasterly direction over the Kara Sea. Amundsen planned to freeze the Maud into the polar ice cap and drift towards the North Pole—as Nansen had done with the Fram—and he did so off Cape Chelyuskin. But, the ice became so thick that the ship was unable to break free, although it was designed for such a journey in heavy ice. In September 1919, the crew got the ship loose from the ice, but it froze again after eleven days somewhere between the New Siberian Islands and Wrangel Island. During this time, Amundsen suffered a broken arm and was attacked by polar bears. As a result he participated little in the work outdoors, such as sleigh rides and hunting. He, Hanssen, and Wisting, along with two other men, embarked on an expedition by dog sled to Nome, Alaska, more than 1,000 kilometres (620 mi) away. But they found that the ice was not frozen solid in the Bering Strait, and it could not be crossed. They sent a telegram from Anadyr to signal their location. After two winters frozen in the ice, without having achieved the goal of drifting over the North Pole, Amundsen decided to go to Nome to repair the ship and buy provisions. Several of the crew ashore there, including Hanssen, did not return on time to the ship. Amundsen considered Hanssen to be in breach of contract, and dismissed him from the crew. During the third winter, Maud was frozen in the western Bering Strait. She finally became free and the expedition sailed south, reaching Seattle, in the American Pacific Northwest in 1921 for repairs. Amundsen returned to Norway, needing to put his finances in order. He took with him two young indigenous girls, a four-year-old he adopted, Kakonita, and her companion Camilla. When Amundsen went bankrupt two years later, however, he sent the girls to be cared for by Camilla's father, who lived in eastern Russia. In June 1922, Amundsen returned to Maud, which had been sailed to Nome. He decided to shift from the planned naval expedition to aerial ones, and arranged to charter a plane. He divided the expedition team in two: one part, led by him, was to winter over and prepare for an attempt to fly over the pole. The second team on Maud, under the command of Wisting, was to resume the original plan to drift over the North Pole in the ice. The ship drifted in the ice for three years east of the New Siberian Islands, never reaching the North Pole. It was finally seized by Amundsen's creditors as collateral for his mounting debt. The attempt to fly over the Pole failed, too. Amundsen and Oskar Omdal, of the Royal Norwegian Navy, tried to fly from Wainwright, Alaska, to Spitsbergen across the North Pole. When their aircraft was damaged, they abandoned the journey. To raise additional funds, Amundsen traveled around the United States in 1924 on a lecture tour. Although he was unable to reach the North Pole, the scientific results of the expedition, mainly the work of Sverdrup, have proven to be of considerable value. Much of the carefully collected scientific data was lost during the ill-fated journey of Peter Tessem and Paul Knutsen, two crew members sent on a mission by Amundsen. The scientific materials were later retrieved by Russian scientist Nikolay Urvantsev from where they had been abandoned on the shores of the Kara Sea. In 1925, accompanied by Lincoln Ellsworth, pilot Hjalmar Riiser-Larsen, and three other team members, Amundsen took two Dornier Do J flying boats, the N-24 and N-25, to 87° 44′ north. It was the northernmost latitude reached by plane up to that time. The aircraft landed a few miles apart without radio contact, yet the crews managed to reunite. The N-24 was damaged. Amundsen and his crew worked for more than three weeks to clean up an airstrip to take off from ice. They shovelled 600 tons of ice while consuming only one pound (400 g) of daily food rations. In the end, the six crew members were packed into the N-25. In a remarkable feat, Riiser-Larsen took off, and they barely became airborne over the cracking ice. They returned triumphant when everyone thought they had been lost forever. In 1926, Amundsen and 15 other men (including Ellsworth, Riiser-Larsen, Oscar Wisting, and the Italian air crew led by aeronautical engineer Umberto Nobile) made the first crossing of the Arctic in the airship Norge, designed by Nobile. They left Spitsbergen on 11 May 1926, and they landed in Alaska two days later. The three previous claims to have arrived at the North Pole: Frederick Cook in 1908; Robert Peary in 1909; and Richard E. Byrd in 1926 (just a few days before the Norge) are all disputed, as being either of dubious accuracy or outright fraud. If these other claims are false, the crew of the Norge would be the first explorers verified to have reached the North Pole. If the Norge expedition was the first to the North Pole, Amundsen and Oscar Wisting were the first men to have reached both geographical poles, by ground or by air. Amundsen disappeared on 18 June 1928 while flying on a rescue mission in the Arctic. His team included Norwegian pilot Leif Dietrichson, French pilot René Guilbaud, and three more Frenchmen. They were seeking missing members of Nobile's crew, whose new airship Italia had crashed while returning from the North Pole. Amundsen's French Latham 47 flying boat never returned. Later, a wing-float and bottom gasoline tank from the plane, which had been adapted as a replacement wing-float, were found near the Tromsø coast. It is believed[by whom?] that the plane crashed in fog in the Barents Sea, and that Amundsen and his crew were killed in the wreck, or died shortly afterward. The search for Amundsen and team was called off in September 1928 by the Norwegian government, and the bodies were never found. In 2004 and in late August 2009, the Royal Norwegian Navy used the unmanned submarine Hugin 1000 to search for the wreckage of Amundsen's plane. The searches focused on a 40-square-mile (100 km2) area of the sea floor, and were documented by the German production company ContextTV. They found nothing from the Amundsen flight. In 1925, Amundsen was awarded the Hans Egede Medal by the Royal Danish Geographical Society. Owing to Amundsen's numerous significant accomplishments in polar exploration, many places in both the Arctic and Antarctic are named after him. The Amundsen–Scott South Pole Station, operated by the United States Antarctic Program, was jointly named in honour of Amundsen and his rival. British novelist Roald Dahl was named after Amundsen, as was Nobel Prize laureate Roald Hoffmann. Huntford's book was adapted into the TV serial The Last Place on Earth. It aired in 1985 and featured Sverre Anker Ousdal as Amundsen. On 15 February 2019, a biographic Norwegian film titled Amundsen, directed by Espen Sandberg, was released. Some[who?] Inuit people in Gjøa Haven with European ancestry have claimed to be descendants of Amundsen, from the period of their extended winter stay on King Williams Island from 1903 to 1905. Accounts by members of the expedition told of their relations with Inuit women, and historians have speculated that Amundsen might also have taken a partner, although he wrote a warning against this. Specifically, half-brothers Bob Konona and Paul Ikuallaq say that their father Luke Ikuallaq told them on his deathbed that he was the son of Amundsen. Konona said that their father Ikuallaq was left out on the ice to die after his birth, as his European ancestry made him illegitimate to the Inuit, threatening their community. His Inuit grandparents saved him. In 2012, Y-DNA analysis, with the families' permission, showed that Ikuallaq was not a match to the direct male line of Amundsen. Not all descendants claiming European ancestry have been tested for a match to Amundsen, nor has there been a comparison of Ikuallaq's DNA to that of other European members of Amundsen's crew. The North-West Passage; Being the Record of a Voyage of Exploration of the Ship "Gjöa". New York: E.P. Dutton and Co. 1908. OCLC 971379351. South Pole: An Account of the Norwegian Antarctic Expedition in the "Fram". 1912. OCLC 727260901. Nordost Passagen: Maudfaerden Langs Asiens Kyst 1918–1920. Kristiania: Gyldendal. 1921. OCLC 576654047. Our Polar Flight: The Amundsen–Ellsworth Polar Flight. New York: Dodd, Mead. 1926. OCLC 918183295. The First Flight Across the Polar Sea. London: Hutchinson. 1927. OCLC 1026703671. My Life as an Explorer. New York: Doubleday. 1927. OCLC 3657624. ^ Some sources give the date as 15 December. Fram crossed the International Date Line shortly before arriving at the Bay of Whales, and thereby "lost" a day. Since the western and eastern hemispheres are conjoined at the South Pole, either date can be considered as correct, though Amundsen gives 14 December, both in his first telegraphed report on arrival in Hobart, and in his fuller account The South Pole. ^ "Østfold county, Borge in Borge, Parish register (official) nr. 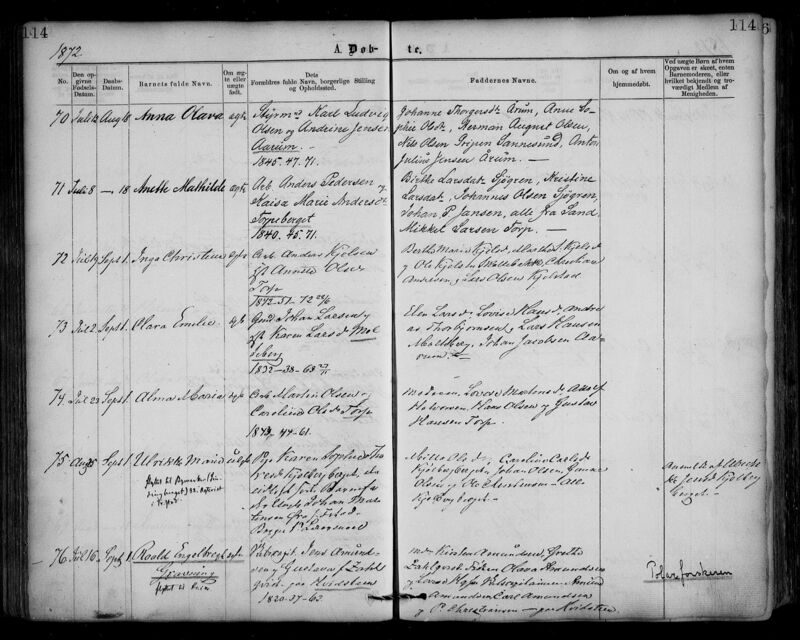 I 6 (1861–1874), Birth and baptism records 1872, page 114". Retrieved 25 July 2012. ^ "Amundsen, Roald" (US) and "Amundsen, Roald". Oxford Dictionaries. Oxford University Press. Retrieved 7 March 2019. ^ "Amundsen". Merriam-Webster Dictionary. Retrieved 7 March 2019. ^ a b Tierney, John (7 September 2009). "Who Was First at the North Pole?". The New York Times. Retrieved 20 March 2019. ^ Holland, Eva (18 August 2017). "Flying to the North Pole in an Airship Was Easy. Returning Wouldn't Be So Easy". Smithsonian Institution. Retrieved 20 March 2019. ^ a b c Thomas, Henry; Dana Lee Thomas (1972). Living Adventures in Science. Ayer Publishing. pp. 196–201. ISBN 978-0-8369-2573-9. ^ Amundsen, Roald (1927). My Life as an Explorer. Garden City, NY: Doubleday, Page & company. ^ a b The Houghton Mifflin Dictionary of Biography. Houghton Mifflin Reference Books. 2003. pp. 43, 1696. ISBN 978-0-618-25210-7. ^ a b Derry, Thomas Kingston (1979). A History of Scandinavia: Norway, Sweden, Denmark, Finland, and Iceland. University of Minnesota Press. p. 298. ISBN 978-0-8166-3799-7. ^ a b c Roald Amundsen and the Exploration of the Northwest Passage. Oslo: Fram Museum. 2008. pp. 63–65. ISBN 9788282350013. ^ a b c d Simpson-Housley, Paul (1992). Antarctica: Exploration, Perception and Metaphor. Routledge. pp. 24–37. ISBN 978-0-415-08225-9. ^ Amundsen, Roald (1913). The South Pole: An Account of the Norwegian Antarctic Expedition ... L. Keedick. p. 1. ^ Amundsen, Vol. I, p. xvii. ^ See Roald Amundsen, Store Norske Leksikon. Accessed 17 April 2011. ^ Barr, William (1919). The Last Journey of Peter Tessem and Paul Knutsen. ^ "Roald Amundsen and the 1925 North Pole Expedition". Historynet.com. 2006-06-12. Retrieved 11 March 2010. ^ "Roald Amundsen". PBS.org. Retrieved 11 March 2010. ^ Henderson, Bruce (2005). True North: Peary, Cook, and the Race to the Pole. W. W. Norton and Company. ISBN 978-0-393-32738-0. OCLC 63397177. ^ Rawlins, Dennis (January 2000). "Byrd's Heroic 1926 Flight & Its Faked Last Leg" (PDF). DIO, the International Journal of Scientific History. 10: 69–76, also pages 54, 84–88, 99, 105. ISSN 1041-5440. Retrieved 13 July 2007. ^ Rincon, Paul (24 August 2009). "BBC". BBC News. Retrieved 11 March 2010. ^ "Search for Amundsen". Archived from the original on 8 January 2010. Retrieved 30 April 2011. ^ "Geografisk Tidsskrift". —. Archived from the original on 10 February 2017. Retrieved 9 January 2018 – via tidsskrift.dk. ^ "The Red Tent (1971)" – via www.rottentomatoes.com. ^ O'Connor, John J. (20 October 1985). "Tv View; 'the Last Place on Earth' - Not Just About the Antarctic" – via NYTimes.com. Amundsen, Roald; Nilsen, Thorvald; Prestrud, Kristian; Chater, A.G. (tr.) (1976) . The South Pole: An Account of the Norwegian expedition in the Fram, 1910–12 (Volumes I and II). London: C. Hurst & Company. ISBN 978-0-903983-47-1. First published in 1912 by John Murray, London. Huntford, Roland (1985). The Last Place on Earth. London and Sydney: Pan Books. ISBN 978-0-330-28816-3. Wikimedia Commons has media related to Roald Amundsen. DIO vol.10 2000 Amundsen's unparalleled record of polar firsts, including evidence that he was 1st to each geographical pole.